I wonder if the Gotham mid-season finale has split its audience’s opinion based on people’s preferred character. If you don’t think Gotham should have a Batman then you’re never going to like the amount of time given over to Bruce and Selina this week. Thing is, I thought theirs’ was the stronger of this week’s three plotlines. Jim’s was the weakest for me, probably because I’ve struggled so much with Lee’s choices in season three but possibly just because of the inevitability of melodramatic problems in a love triangle. Leaving Nygma and Penguin’s story, which I’d place somewhere in the middle: It offers the promise of an interesting chaos to come but robs me of the crime-duo buddy-story I’ve long hoped for. Another notable point about ‘The Green-Eyed Monster’ is that no major villain was defeated. I’m used to both Gotham’s mid-season and full-season finales having an end-of-level boss – or at least lieutenant – takedown. Does this mark a point where all the major Batman enemies have been introduced and now more time is going to be spent on existing characters? Alternatively, do you need a main villain defeat to enjoy a finale? Perhaps again you do feel this way but think the defeat of Talon covered it? Personally I don’t need this and I’d say that ‘The Green-Eyed Monster’ was one my top episodes of the season so far. I did wonder for a while if finales are by definition more enjoyable than other episodes simply because they get a climax but then I remembered ‘Transference’, which closed out season 2 – I was not a fan. Reflecting on ‘The Green-Eyed Monster’ then, I think I can say that I enjoyed it more for what actually happened and especially because Goddess Plot didn’t have too much influence: With the exception of a certain challenge that I promised last week I wouldn’t bring up again, I think all the characters this week made decisions that fitted their nature and goals, none having to do anything out of character purely for the needs of plot advancement. Mario could have killed Jim in the laboratory? Well, he could have, but he wanted Lee to hate Jim, which seems reasonable for an insane, still-doctor-clever jealousy. Like Barnes, Mario never had unstoppable Hulk rage. In both cases, during the early stages of the virus the victim has consistently been able to enact a plan. But Tetch needlessly gave up all that information to Jim? Actually I wouldn’t say needlessly. I’d say instead that this is Jim’s return to form. He’s not the muscle of the GCPD – despite being pretty good in a fight – he’s one of the force’s top detectives, which he’s proven many times before. In Jim’s presence Tetch has fallen into rhyming language whenever he’s gotten excited or stressed and here Jim takes advantage of it. I love to see this. It’s one of the best things about Detective Gordon as a character and I can’t get enough of it every time it’s used. If it weren’t for inevitable love-triangle problems Jim’s being dragged through I would have rated his plot higher because of this good use of Jim’s capabilities. As it is, that final shot of the knife falling away in slow motion, all out of sight of Lee who only saw Jim murder her beloved for no reason, could easily have been taken out of an episode of Dallas, Emmerdale or any other over-the-top soap opera you can name. I get that we’re watching comic book material here but still, isn’t everything about this love triangle far too far into melodrama and bad afternoon-TV plotting? The underlying idea feels like it should work. An investigation into the beast within us is perfectly fitting for Jim Gordon trying to work out how much of an idealist he can afford to be in a city that corrupts everything and everyone within it. Jim’s tried following the right path, he’s compromised himself for what he sees as the good of others and now he’s struggling to come back from the edge without becoming what he started out fighting against. On that edge is the rage that wells up in someone who follows the law and just can’t believe that others can flaunt it so blatantly, and then get away with it! And Barnes is the perfect exploration of this… but Mario? It does allow Jim to consider the beast within still but not to do with any choice he has to make himself? I don’t know, perhaps it does: He might reflect on how he needs to make sure he doesn’t follow the example. Actually given that Jim did unhesitatingly shoot two of Falcone’s henchmen, maybe does still have his own monster to deal with. They were still moaning after they fell though, weren’t they – indicating that he didn’t intend to kill them? All this being a possibility though, I’m still having trouble accepting Lee’s decisions that lead us here. Fair enough she’s been through so much that she ends up slapping Jim but the idea that she welcomes Falcone as a father in law is beyond me. She’s never been into the bad boys before, has she? And it can’t be about getting the stability that Jim can’t offer, what with marrying into a crime family and all. And whilst we’re vaguely on the subject, though I promised not to talk about it, can I just say: Doesn’t Zsasz still doing odd jobs for the Falcone family prove my point about certain people having too much influence still and certain other people needing to be wary of this? Alright, “a promise is a promise Mr Frodo”; I’ll leave it be. Back onto the positive. Bruce’s plot was so enjoyable this week that there were only a couple of little things that gave me even the slightest pause. (Not positive enough? Stay with me.) I did wonder if Bruce could possibly have the strength to hold Selina up on that rope. However, does that really matter? It didn’t spoil anything, so I’m happy to say no. I also found myself a bit wary when Selina’s mother showed up but honestly at this stage that can only be my darkness, so I’m leaving it there. Beyond that the scenes were a joy to watch. I always like to see Alfred and Selina together – don’t think they ever disappoint. Even to the extent that though you know Selina’s walkaway – after Alfred points out Bruce has protected her from the Court of Owls – is just a fake out. She was always going to come back and see Bruce in a better light with it but the act of leaving for a bit is just her style. It’s in character and it still has a value: When she comes back you can say “I knew it”. If she didn’t come back you’d know there was a problem. It’s the consistency here that makes it a good thing. On the consistency front I still say that Bruce and Selina’s fledgling relationship is much more interesting to watch than Jim’s drama. To some extent this is no doubt because of the skills of the actors. Camren Bicondova and David Mazouz both manage to do just as much with a look as they do with a line. Take Bruce’s confident grin for example, when they’re on the roof opposite the Court of Owls’ safe house, just before he declares Selina to be his girlfriend after all. They’re all little moments but they add so much. To be fair the two aren’t hampered by melodrama in their writing – not to detract from their ability. For whatever reason though, their scenes have a strength in subtlety that the adult romances aren’t given. That little kiss on the cheek that Selina gives Bruce before they begin the rope walk tells Bruce everything he needs to know about their relationship. It’s a thousand words in a single picture that requires no slow motion camera work or ‘dramatic music’ to hammer the point home. Coming away from the main characters, I’d also say that Bruce’s scenes still measured up to this mark. There were the simple things like it just being nice just to see Selina as Cat again: a confident and capable acrobatic thief. At the other end there’s also Talon. Using hardly any dialogue Gotham created in Talon a credible enemy with a high threat level that you easily believed needed four people to bring down. I like to see Alfred – ex-SAS serviceman – showing off his skills and often think he should do better against some opponents but against Talon it was clear that Bruce, Selina and Alfred together were outnumbered. I never thought they would die of course, but the serious threat meant they couldn’t do better than escape by themselves – even then not all of them. ‘The Green-Eyed Monster’ is my pick of the season so far, neatly dodging a lot of the problems I’ve had with many of the previous episodes. 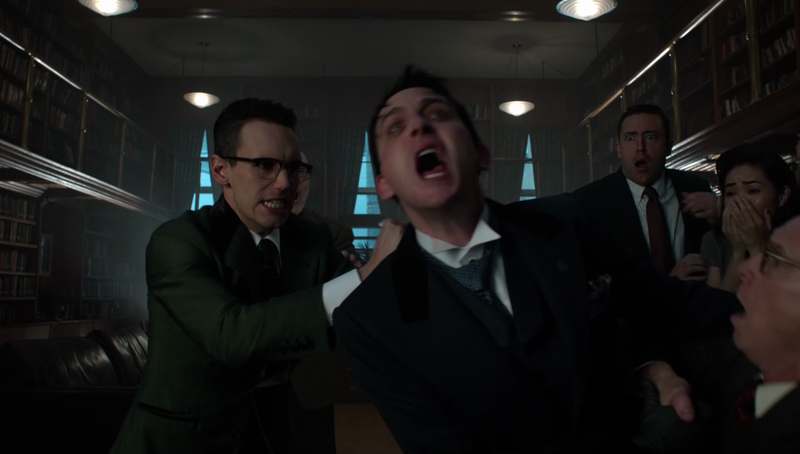 Nygma and Penguin’s plot has had some high moments throughout the half season but I think the best of them have been concepts rather than actual story turns. And though they’ve clearly achieved a lot together I think it’s a shame that they never went on any real adventures as a criminal partnership. 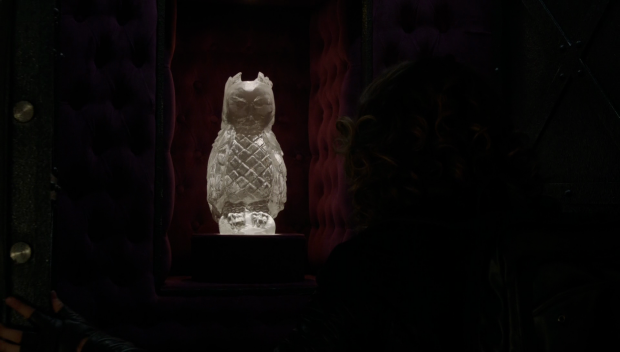 The war that’s coming promises to be the very chaos predicted by the Court of Owls. In the next half season I think this could easily keep me glued to the screen but so far in my head their plot is downgraded more towards just the setup for that, rather than being great by itself. Jim’s plot reached a high during ‘Red Queen’ that his plot since has struggled to live up to. It’s like he had his mid-season finale four episodes ago and has been loitering around a crazy romance for something to do whilst the other main characters catch up. 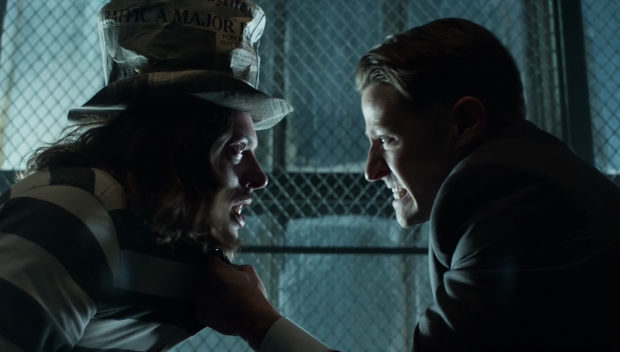 This is a great shame for Ben McKenzie in my mind, as ‘Red Queen’ showed what the actor can do and even just Jim’s short moment with Tetch this episode shows what the character can do. I hope ‘The Green-Eyed Monster’ is the end of Gotham trying to copy Dallas and the melodrama gets put to bed here once and for all. Bruce, Selina and Alfred’s scenes this week were my over and above favourite. I’d rather they’d gotten an episode to themselves in fact, as Jim almost got with ‘Red Queen’. Then we might have enjoyed more of the threat posed by Talon and more of the back and forth between Selina and Bruce, and between Selina and Alfred even. It might seem a shame to you that Gotham is so much about Batman-yet-to-be but the subtlety in the writing this episode and the ability of the younger actors as a matter of course go to prove why the Bruce plots are in such demand. I actually felt that Selina was incredibly out of character when she commented on what a punk move it was for Bruce to make that deal. She has consistently advocated for looking out for number one (and then always returns to do the right thing, which you also comment on) so it doesn’t fit for her to think the deal is weak when she mistakenly believes it do be done for self preservation. Especially after the same scene showed her worried about Bruce’s safety. Came accross as a contrived way for Alfred to tell Selina why Bruce made the deal, thus setting up her return later. This could have easily been done without Selina implying Bruce was weak for making the deal. In fact, it would have played much better had she commented how pointless Bruce’s deal was if he was going to back out at the first opportunity. Plays much better with the beginning of the scene and Selina’s worry for Bruce, yet still provides Alfred the opportunity to explain why Bruce made the deal in the first place. She’s a street kid who knows you have to look out for number one but secretly she wants to believe in something better, even if just because she’s young enough not to have had the hope beaten out of her yet. She tried to do the right thing by Ivy and Bridgit, so she still believes in a better something. Also, she is very prideful as we’ve seen her so far. My thinking then, was that she thought Bruce gave in too easily to the Court, which doesn’t sit well with her need to fight the world. But Alfred then tells her that Bruce did it just to save his loved ones – of which Selina is one of course. That appeals to the part of her that wants to save her friends. However, she’s too proud to admit a mistake in judging Bruce right away, so she leaves to show she still thinks she’s a little bit right – but then she comes back to show that what Alfred said and Bruce did does mean something her. Now, I know I’ve misread things into this show before, so I’ll not say that’s what the writers meant, but that’s how I first interpreted what I saw. You may well be right about Bruce’s deal being pointless, as he’s not been through a real challenge of it yet – had to give something up to preserve the deal. I’m happy that he want to get out of it at some point though, as the Court holds all the cards and he’ll always be their puppet unless he can somehow take the upper hand. As you say though, maybe it would have been a more powerful moment if this hadn’t been the very first opportunity. 1. As opposed to using their limited one-on-one screen time the last few episodes to focus on the whole not a couple thing and making that their main point of conflict – when it easily could have been secondary and still had the humourous “does this mean you’re my girlfriend” moment later in the episode – why not make it about Selina questioning Bruce’s motives for making the deal etc. Bruce then doesn’t tell her the truth and Alfred questions why he doesn’t, with Bruce saying he doesn’t want her to know for some perceived noble reason. That way when Alfred is the one to break it down for her the emotional impact is two fold a) Alfred and Selina’s moment has an extra layer in that it is essentially him taking a visible interest in her with Bruce by telling her the truth against Bruce’s wishes and b) she is blindsided by hearing this from Alfred over Bruce. That way she can still leave with hurt pride and still return later. 2. Save this “bullet” so to speak and have this be the beginning of her questioning the deal as Bruce starts to fight back against the Court. Still easy to see her coming back to help at the end, in fact sells the “does this mean you’re my girlfriend” even more if she returns despite not agreeing with Bruce. That allows her disappointment to linger for awhile and then the reveal could have come later in the season when she is inevitably questioning herself and/or Bruce because of her mother’s return (the obvious way this plot is going). I just don’t think that Selina’s disappointment in Bruce was developed enough given that the moment she outright expresses her feelings on it she immediately finds out the truth. Her finding out the truth obviously isn’t a massive jaw dropping reveal by any stretch, but it certainly could have been used more effectively, especially given the limited screen time Bruce and Selina are given to develop the relationship that will be/is so iconic. You know what? Fair play to that argument. I knew I wanted to see more of the three of them together – making more of all of their connections – but I wasn’t able to express what I wanted to see. The episode – possibly episodes plural – you’ve just described would have been great to watch. I’d agree that Gotham still struggles with time: with so many characters to get through none are ever going to get any real detailed treatment and it’s always a shame. Nygma-Penguin’s plot hasn’t really affected me as much as the individual events feel like they should have. Red Queen could have really been a big deal for Jim recovering from a devastating fall from grace. Here you’ve just given good example of the power a Bruce-Selina moment could have had. Strangely Gotham has slowed down since the first season but maybe not enough? Noticeably too the rare episodes that do have a focus on one set of characters are generally better, I think. Maybe instead of slowing down further then, we should hope for more focused episodes, allowing the strength of the connections between characters to build better. Exactly. And Red Queen is a great example of this. 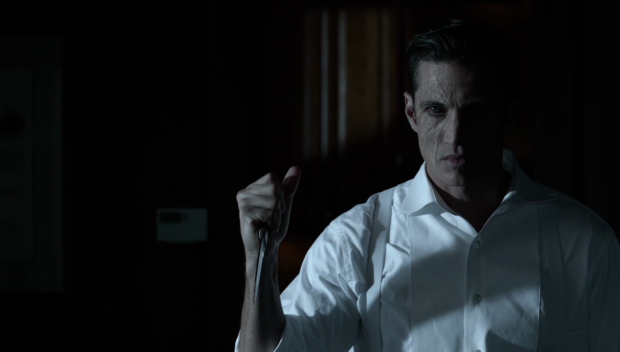 What could have been a great episode illustrating Jim’s fall from grace, and subsequent recovery, instead had random Nygma/Penguin moments and 2 minutes of Bruce and Selina that either did nothing for the storyline (in Bruce/Selina’s case) or just flat out has missed the marks they could/should have hit in the case of Nygma/Penguin.